Is The Buick Regal Set For A Major Design Overhaul? Spy shots of its European counterpart suggest big changes are coming for the luxury sedan. Towards the tail end of 2018, we spotted a camouflaged Opel Insignia Sports Tourer out testing with what appeared to be updated front and rear bumper designs. 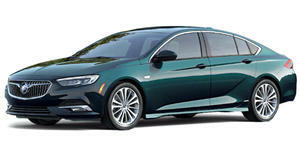 In case you don't already know, the Opel Insignia is significant because it is rebadged in the United States and sold as the Buick Regal. In the time since the Regal was introduced, General Motors sold the Opel and Vauxhall brands to PSA, leaving the future of several Buick models in question. We've already seen the Buick Cascada, which was also a rebadged Opel product, discontinued because of slow sales. While Regal sales are far better, PSA's moves have been sparking a lot of questions about what will happen to both the Buick and Opel versions of the car. We first saw the Insignia Sports Tourer testing at the Nurburgring and sedan has now been spotted with similar camouflaging. As with the wagon, the sedan model was heavily covered in the front to disguise any changes to the grille design. The rear was covered with a bit of camo over the taillights but it seems like the updates will mainly be to the front end of the car. Judging by the appearances of the wagon and sedan test mules, Opel's new owner is looking to update the Insignia so it looks less like a GM product. In addition to the new face, the Insignia may be receiving new engines from the PSA Group as well as different infotainment and interior pieces. With all of these rumored changes, it is unclear how many (if any) will make their way to the Buick Regal. When PSA purchased Opel and Vauxhall, discussions were likely held about how the sale would impact the Buick brand but none of this information has been made public. Buick will have to turn to a different source for its future models so it will be interesting to see how the American luxury brand will proceed.